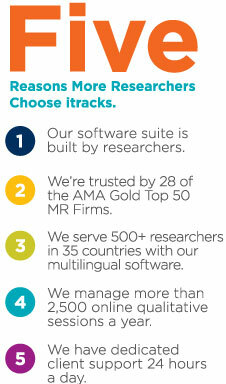 No one knows online qualitative research software like we do. We were pioneers in this world. We leverage proprietary technology to deliver high quality data faster than ever. Whether you require consumer insights or prefer to access the technology to conduct research on your own, our team is dedicated to ensure your research objectives are met with success. “The Canadian Physiotherapy Association used itrack’s service at a key step of its collaborative strategic planning process in 2017. After engaging a large number of internal and external stakeholders to identify the issues and challenges that the profession will likely face in the coming years, the Association moved on to explore these issues in depth and to identify proposed solutions with inter-professional expert groups in a series of roundtable discussions all across Canada . Five such expert discussions took place online (to complement four live events in major Canadian cities) with nearly one hundred participants on itrack’s platform in a five-day period in May 2017. CPA’s strategic consultants were co-moderating the online discussions with itracks. The registration process and the interactions were safe and easy to work with; both the participants and consultants appreciated the flexibility of the platform and were very impressed with the “treasure trove” of ideas that the online discussions produced. The expert roundtables prepared the groundwork for a strategic workshop in June that involved all of CPA’s leadership groups from the federal and provincial levels, and successfully reached a consensus on CPA’s new mission, vision and strategic priorities. Karen Schmutz, Field Operations Director, Zeldis Research Associates, Inc.
“Everything went exceptionally well. We are currently writing the final report on the results. The software was fantastic – no problems at all! The use of the iMarkIt tool allowed the participants to freely express themselves at their leisure. I had very little to do as moderator, other than to clarify internal inquiries about our subject matter. Candace was great with answering our concerns. We look forward to working with you again in the future. “The experience was awesome. The methodology was so perfect for the subject matter. The respondents were super engaged. The clients loved it. The learning was really valuable. Your guys were great – responsive, available, helpful, nice! I’ve got to book my focus group project – a series of one-on-ones using your infrastructure. And my colleague is running an online board too.